The father of modern Tudor history, G R Elton, rebuts the idea of the rebellion being motivated by a desire to have the monasteries restored, as, at the point the rebellion took off, only the smaller houses had been targeted, and few had actually been suppressed. Later writers refute this, and argue that, even if restoration of the monasteries was not, per se, the aim of the rebels, their underlying religious conservatism, their fear of heresy and despoliation of their parish churches, coupled with rumours about the taxation of christenings and weddings were all root causes. The Act of Supremacy of 1534 declared Henry VIII to be Head of the Church in England, and threw off the authority of the Pope. The change had been, somewhat reluctantly, accepted by the clergy at large, and whilst it is too much to say that no-one else much cared, it is apparent that the position of the Pope was not of huge interest to the population. What did matter to them, were their local churches and their local religious practices. The whole Lincolnshire Rising was sparked off when rumours spread that Commissioners were coming to take away all of the church plate, paid for by the offerings of the parish over decades, and give it to the King. Another genuine concern, although it may seem bizarre to us now, is the reaction of much of the populace to the Act of Ten Articles which demoted prayers for the dead from a fundamental element of Christian practice, necessary for the salvation of souls, to being acceptable for reasons of tradition and good order but "not expressly commanded of God, nor necessary to our salvation". Much of mediaeval daily religion was based around the doctrine of purgatory and people feared that prayers for the dead would be abolished, leaving their ancestors to suffer in the torments of purgatory. The recent Acts had also abolished the majority of Saints Days and festivals, during harvest period from 1 st July to 29th September. This was much resented, as was the command that all local parish festivals in honour of the saint to whom the church was dedicated should be carried out on 2nd November, rather than on the individual saint's day. With regard to the monasteries, it does not seem from the evidence that they were always held in high esteem – a number of their Abbots were forced to join the Pilgrimage with the threat of the monastery being burnt to the ground, and several tithe barns (barns housing the proportion of harvest due to the church) were destroyed. However, what was important, was the desire to keep them as economic units in the North. It was feared that without them, unemployment would be significantly increased and economic life reduced. Only in Cumberland and Lancashire is there definite evidence that the monasteries were of concern. Their contribution to charity while it seems depressingly low (11% of their income, on average) was certainly higher than the national average, calculated by the Valor Ecclesiasticus at a mere 3%.If the evidence of Wills of the period is to be believed, the lay community was more concerned about the parish churches and the Friaries. Whatever the general view of the Pilgrims about the monasteries, Robert Aske, one of the primary leaders was a positive supporter of them, and the specific demands he drafted included the restoration of the houses that had been suppressed, and also the restoration of the Friars Observant, a particularly popular brotherhood which had been dissolved, mainly because of its outspoken opposition to the annulment of the King's first marriage. 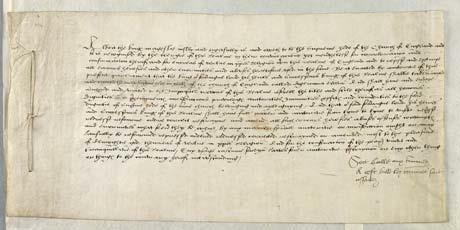 In the autumn of 1536, there was no legal heir to the English throne. The King's elder daughter, Mary, by his first wife, Katharine of Aragon, had been declared illegitimate. His younger daughter, Elizabeth, by Anne Boleyn, was also illegitimate, besides being less than three years old. His son by Bessie Blount, illegitimate in anyone's opinion, had died in the summer of the year. The people of the North feared that his nephew, James V of Scotland, would be declared his heir – the idea was absolute anathema to them. For all Henry's declared concerns about female heirs, it was apparent that the Princess Mary would be a far more popular choice than King James. G.R. Elton believed that the Pilgrimage was essentially a court conspiracy, aimed at overthrowing the hated Cromwell. 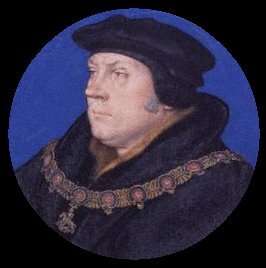 Thomas Cromwell, however his reputation may have been rehabilitated by Tracy Borman and Hilary Mantel, was thoroughly unpopular in his own time, both with rivals for power at Court, and amongst the populace. All classes blamed him, rightly or wrongly, for the King's policies. Cromwell was a self-made man, and in a world that was intensely hierarchical, this was seen as threat to the whole fabric of society. The older families resented his power, and the Commons, whom centuries of subservience had made loyal to their traditional lords, struggled to come to terms with the idea of someone no better born than they, wielding huge power. It was also conventional to disguise rebellion as the desire to remove "evil counsellors" from the King. A further measure, resented by the gentry and nobility, although it was irrelevant to lower ranks, was the Statute of Uses. In accordance with feudal practice, if an estate passed to a minor, both land and heir would fall into the King's hands until the heir's majority, at which point the heir would "sue his livery" by paying a fine and taking possession. To avoid this, it was common practice for landowners to transfer their lands to "feoffees" (similar to a modern trustee) who would then hold the land until the heir reached twenty-one, and transfer it back to him. The Crown was missing out on valuable income. After numerous bills had failed to pass through Parliament, eventually the King got his way, and, leaving aside the arcane detail, retained control of minors, thus increasing his revenues at the expense of his vassals. At a local level, in Cumberland and Westmoreland, there was rivalry between the Clifford and Dacre families that had led to instability. This was the background against which the rebellions took place.